Having a chocolate fountain at your event is all about extravagance and adding the wow factor, lets face it, if you wanted to offer your guests chocolate and fruit there are much cheaper ways of doing it, what we provide is the whole experience, from walking in to seeing the fabulous, perfectly flowing chocolate (not to mention smelling it too), to the appealing arrangement of freshly prepared high quality dips. Our fountains are the largest available at 50″ (1.2meters), and come complete with the illuminated surround, the colour of the lights can be changed to match your theme, and we can also supply edible glitter, coloured napkins and other decorations if required. We are now able to offer the option of a double fountain allowing clients to have two types of chocolate at the same time! Just like our smaller chocolate fountain but twice the choice . . . .
We will design, set up and staff the table for you, your guests will be so delighted to see a beautifully set up “sweet shop” all for them, it will keep them talking for a long time to come, as far as we know, there is no service like it in the West Midlands and lets face it, its always good to be the first to have something so spectacular and different isnt it? You can choose from a selection of themed tables, our vintage tea party table is already a stand out favourite, so pretty and elegant, we are also in the process of creating a blinged out crystal table and a Willy Wonka style table. Alternatively, let us know your fantasy table and let us create it for you. Either Ferrero Rocher or Chocolate Truffle versions available. 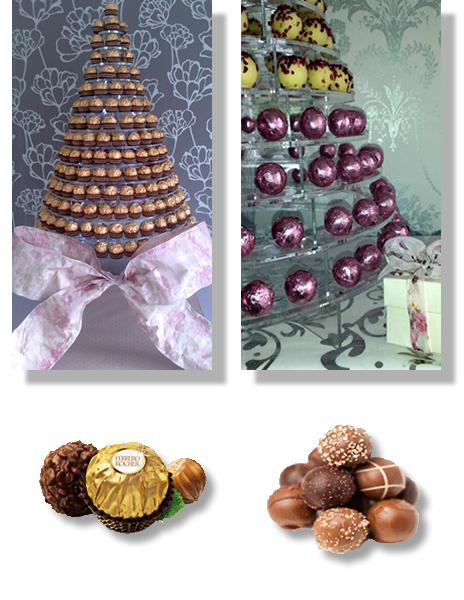 Call us for a special discounted price when adding one of our towers to your Chocolate Fountain or Candy Buffet booking. Chocolate Fountain V Candy Buffet. . . . cant decide? You can have the best of both worlds. . . . A candy Buffet with a Chocolate Fountain ! 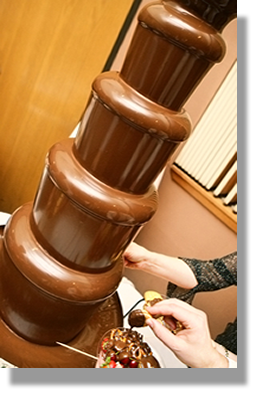 We offer the option of our mini 19″ Chocolate Fountain incorporated into an individually designed candy buffet. Ideal for events with upto approximately 100 guests. Every event is different, and the cost is affected by different factors, how many guests, day of the week and travelling distance to the venue, please give us a call or email for a tailor-made price. 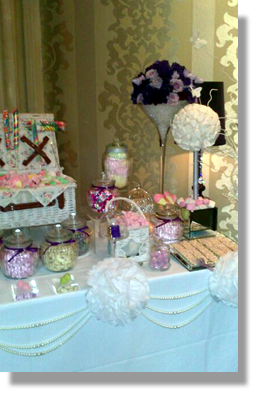 As an example, prices start around £200.00 and always include set up, all of the amazing goodies and trained staff who stay and assist your guests and top up the displays. If you really want to go all out and spoil your guests, we can offer a double package when booked with our towering 50″ chocolate fountain.